Since the beginning of the year, no less than 1300, Rohingya Muslims crossed the border into Bangladesh from India. 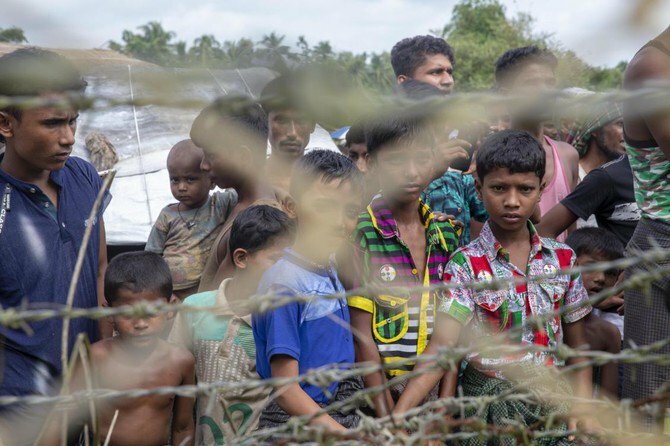 The exodus was triggered due to fears that India would forcibly turn them over to Myanmar, as it did other members of the persecuted minority, having succumbed to the demand of the Hindu extremists. Rohingya Muslims are seen stranded in Bangladesh-India Cosba border under the open sky while Indian BSF is trying to push them into Bangladesh and Bangladeshi BGB is also trying to resist the BSF’s plan. It is a clear message from Hasina government that they will not take any more Rohingya ‘burden’. By now we must have understood that the solution to the Rohingya crisis does not lie in the hands of the secular ruler of Bangladeshi nation-state, nor in the hands of other so-called Islamic countries and OIC. Rulers of these nations do not ascribe themselves to the concept of ‘ummah’. Thus, unsurprisingly, the Rohingya are also considered as ‘burden’ by the Awami League government, and, moreover, the utility of the ‘Rohingya cause’ is already over for this government. For the Rohingya, their protection is their ‘state’ under the leadership of the Khalifah (Caliph) who will be the commander of the Muslim army. Problem like this where the Rohingya Muslims are now suffering require a military situation where the Muslim Army should have mobilized without any delay. But the puppet leaders of the Muslim nations are busy with passing condemnations, requesting relief materials or proposing reversions for the killers. Reaffirming her government’s tough stance against corruption, Prime Minister Sheikh Hasina yesterday directed the public administration ministry to issue a strong warning against graft by field-level administrations. The PM wondered why there would be corruption even after significantly enhancing the salaries, allowances and other privileges of public servants! Interesting! The one who has just come to power through a landmark corruption in the parliamentary election by manipulating public administration, is now speaking loud against corruption! We know that these are only sound-bites having no substance. The current regime has neither the willingness nor the moral right to curb corruption at field-level. The PM has also got it wrong – enhancing the salaries and allowances has nothing to do with corruption. It is connected with the greediness and discontentment which is being natured by the political ideology ruling the country. If we look at the number and gravity of corruption cases, we will find that the rich, educated and privileged sections of our society are indulged in corruption more than others. Corruption is an integral part of the current capitalist-democratic system. In capitalism, money is mixed with politics and it is the evilest mixture. The capitalists take political control of a society and make rules to realize their vested interest. It’s a value-free society where everyone is busy looking after his own interest and success is measured by the amount of wealth one possesses. So, corruption is considered normal and to some extent socially accepted under capitalism. Even in the so called developed Western countries, we see corruptions but there they often manage to conceal it with a practice called ‘playing by the rules’. Hence, if someone is sincere about removing corruption from our society s/he must first of all identify the root cause of corruption which is the very political system we are having. For eradicating corruption from our society we have to remove this selfish-corrupt political system and replace this with just one that will not allow mixing capital with politics and nurture Taqwa in the society. The mega corruption news of the 4th grade employee at the Institute of Health Technology under the Directorate General of Health Services (DGHS) has drawn national attention. According to the primary investigation of Anti-Corruption Commission, he accumulated wealth above BDT120 million through different kinds of corruption. But one key aspect in this whole story being missed is that several evil nexuses exist in the health care system of Bangladesh for this level of corruption. A mere junior level office staff is not capable of doing such kind of systematic corruption without the help of higher-ups. Junior employees are acting as a collection point of illicit money for top ranking officers, and disseminate the share to the rest of the officials including the ministers. Through this process, the ruling class, the vested interest group, and the government officials pillage peoples’ money as they use their position to maximize personal benefits, and the minister is also not out of this evil nexus. This is how the capitalist-democratic ruling system works, and that is why we see that when the businessmen invest in politics they naturally expect a good return of their investment and that is only possible through corruption. In Bangladesh, the percentage of businessman MP in the parliament has increased from 18% in 1973 to 61% in 2019 (It is a businessman parliament again? (The Daily Star, 13.12.2018). The threat of the minister is nothing but rhetoric which is to create media sensationalism to mislead the people. If they were really sincere about people’s affairs, they would dig into the root of the corruption, which is the prevailing democratic political system, the system which drives people to maximize their own interest by suppressing others.